Kids will love the fun green color, parents will love the added nutrition, and everyone will love the delicious taste! 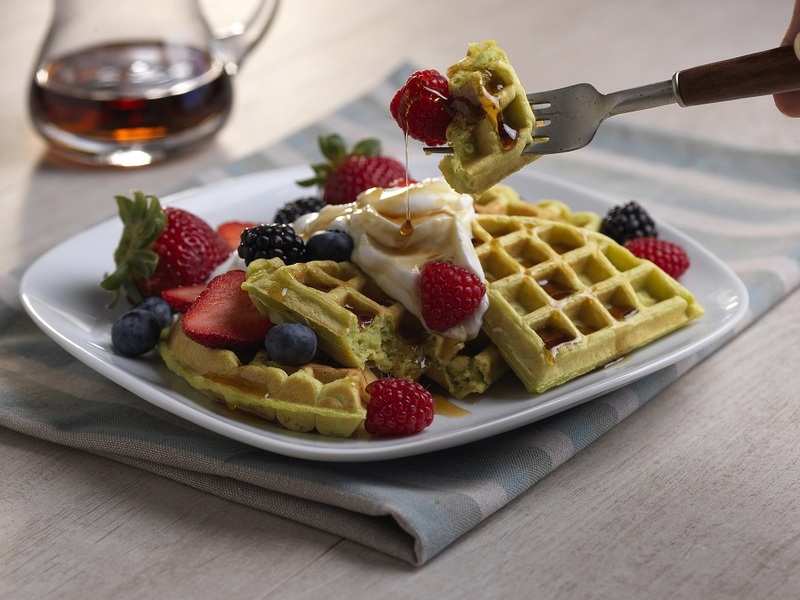 By using avocados instead of butter, these waffles have the added benefit of fiber, monounsaturated fat and healthful plant compounds. This recipe serves four and can easily be doubled to serve a crowd. Add flour, sugar, baking powder and salt to a medium bowl and mix. Set aside. Add avocado, milk, eggs and vanilla to a blender or food processor and blend until smooth. Pour avocado mixture into flour mixture and stir until combined. Spoon batter onto waffle iron and close (about half the batter for a Belgium waffle maker). Cook waffle according to manufacturer’s instructions, until golden brown. Remove to plate and keep warm. Repeat with remaining batter. To serve, top waffles with sliced strawberries, blueberries, blackberries and raspberries. Top with yogurt and maple syrup as desired.